Hillary Rodham Clinton said Tuesday she made a mistake in claiming that she came under hostile fire in Bosnia 12 years ago, as rival Barack Obama's campaign continued to challenge her credibility. In a recent speech and interviews, the New York senator described a harrowing scene in Tuzla, Bosnia, in which she and her daughter, Chelsea, had to run for cover as soon as they landed for a visit in 1996. But video footage of the day showed a peaceful reception in which a young girl greeted the first lady on the tarmac. Clinton told reporters in Pennsylvania on Tuesday that she erred in describing the scene, which she now realizes after talking with aides and others. "So I made a mistake," she said. "That happens. It proves I'm human, which you know, for some people, is a revelation." 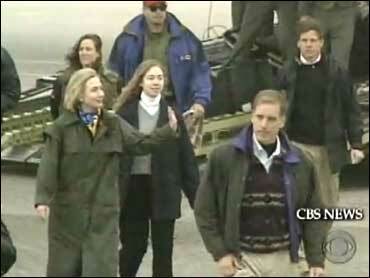 She claimed she misspoke and was sleep deprived, but CBS News has found several times in the past few months Senator Clinton used the Bosnia trip to try to show her international experience, reports Sharyl Attkisson. Clinton did so in Iowa in December, Texas in February and also last week. Watch Attkisson's report, complete with new video from the Tusla tarmac. After CBS News video showed what really happened when she landed and greeted officials, Senator Clinton maintained there were risks but explained to the Philadelphia Daily News why she was seen on the Bosnia tarmac greeting a young child if it was really so dangerous. "I was also told that the greeting ceremony had been moved away from the tarmac but that there was this eight-year-old girl and I said, 'Well, I, I can't, I can't rush by her, I've got to at least greet her,'' Clinton said. "So I greeted her, I took her stuff and I left. Now that's my memory of it." Once again her memory doesn't match CBS News videotape, Attkisson reports. She and her daughter Chelsea lingered on the tarmac to greet U.S. military officials, took photos, and then walked to the armored vehicle where she did, eventually, duck and enter. The more important issue, Clinton said, is whether she would be a better commander-in-chief than Obama or Republican presidential candidate John McCain. Clinton and Obama are competing for votes in Pennsylvania's April 22 primary. Clinton's aides had tried to control the Bosnia flap Monday, saying the New York senator "misspoke." But Clinton had to address the issue herself Tuesday, after repeated airings of the 1996 video clips caused critics to ridicule her. Reminded that she had said it was the first time she had misspoken in 12 years, Clinton told reporters: "I was joking. Lighten up, guys." In a March 17 speech in Washington, Clinton said of the Bosnia trip: "I remember landing under sniper fire. There was supposed to be some kind of a greeting ceremony at the airport, but instead we just ran with our heads down to get into the vehicles to get to our base." That account was still posted on her campaign Website Tuesday. Clinton told CNN last week, "There was no greeting ceremony, and we basically were told to run to our cars. Now, that is what happened." Several news outlets disputed the claims. Clinton began retracting the remarks in a series of private interviews Monday and Tuesday before addressing about two dozen reporters here after a speech. She told the Pittsburgh Tribune-Review: "I was sleep-deprived, and I misspoke." She told KDKA radio in Pittsburgh: "You know, I have written about this and described it in many different settings, and I did misspeak the other day. This has been a very long campaign." The Obama campaign fueled the Bosnia brouhaha Tuesday, sponsoring a conference call with Pennsylvania reporters that featured retired Maj. Gen. Walter Stewart of the Pennsylvania Army National Guard. Stewart said he was assigned to the Army's European headquarters when Clinton visited Bosnia as first lady in 1996. He said her claim that she landed under enemy fire insulted U.S. soldiers charged with her security. Clinton's explanation that she misspoke was "really astonishing," said Stewart, who supports Obama. "She has no sense of what a statement like that does to soldiers," Stewart said. "She is insulting the command in its entirety." "Believe me, heads would have rolled all over" if the military put the first lady and her daughter in a position of "unacceptable risk." At her news conference, Clinton said, "the military and the Secret Service did a terrific job" of handling the situation in Bosnia. "We did take precautions," she said, noting that she was the first president's wife to enter a war zone since Eleanor Roosevelt. Clinton did her best to change the subject Tuesday. She launched her first TV ad in Pennsylvania, in which she promises to "end $55 billion dollars in giveaways to corporate special interests and invest it in middle class tax cuts and creating new jobs." The ad aired in Ohio prior to its March 4 primary. At a rally in Greensburg, east of Pittsburgh, she proposed ways to help Americans save for retirement. She would offer up to $1,000 in matching tax cuts to middle-income families who put money into retirement savings accounts. About 3.4 million Pennsylvania families would qualify, she said. Clinton's plan also would "close the loophole that allows companies to cut their employees' pensions when they sell off subsidiaries," her campaign said in a statement. She also called for bankruptcy law changes to reduce companies' ability to evade pension obligations. On another front, Obama campaign aides posted his tax returns from 2000 to 2006 on his campaign Web site, and called on Clinton to do the same. They also called on Clinton to release full records of her daily schedule during her eight years as first lady. Clinton said she hoped to release her tax returns "within the next week."